Willard Elementary School Principal Cassandra Richards received the Whitey Littlefield Community Bridge Building Award from the nonprofit LBLGP. She was recognized for building bridges between the gay and straight communities. LBLGP, which is located only blocks from Willard, has paid for field trips and provided other support to the school, while Willard staff have contributed to LBLGP’s annual toy drive. 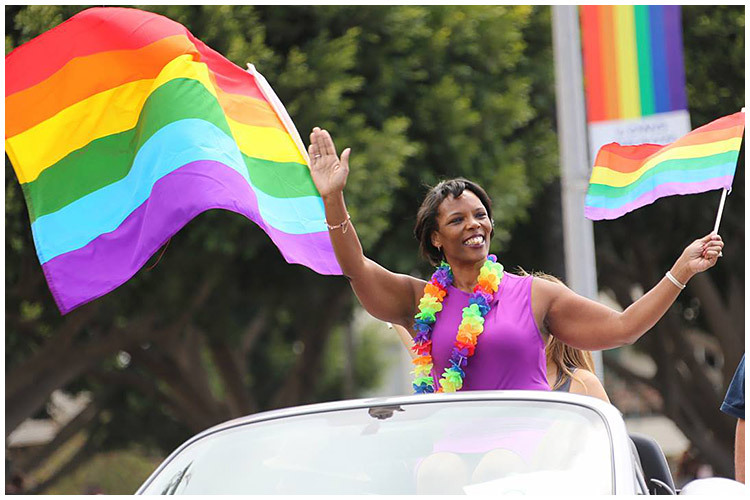 Richards, who was featured in a May 15 article at gazettes.com, was honored as one of 10 grand marshals at the recent Long Beach Pride Parade. California Academy of Mathematics and Science student Celeste Goodwin won the May 8 National History Day State Finals, and for the second year in a row she will represent California at the national competition in Bethesda, Maryland. This year’s nationals are scheduled for June 14 to 18. The Council for Exceptional Children Chapter 108 recently honored 13 recipients of the Hats Off Award. The award is presented to people who support students with special needs. The recipients were Daniel Argyen, owner of John's Hamburgers; Mike Hutton, owner of Dave's Other Place; Randy Bowden, drama teacher at Wilson; Dana Brown, math teacher at Lakewood; Brian Dokko, vocal music teacher at Poly; Lauree Gollner, physical education teacher at Hill; Ronald Harmon, art and music teacher at Marshall; Nicole Reyes, English teacher at Bancroft; Sonia Jimenez, counselor at McKinley; Kate Komatz, counselor at Los Cerritos; Ken Owens, counselor at Garfield; Victor Fluckers, guidance specialist with the Child Development Center; and Angela Rivers, executive secretary at LBUSD’s Office of School Support Services. Avalon K-12 School alum Christopher Padilla is featured in the Cal State Long Beach Daily 49er as the first to graduate from CSULB under the Long Beach College Promise, a partnership with LBUSD, Long Beach City College, the university and the city designed to help local students prepare for and succeed in college. Read the Daily 49er article.